Complications with refeeding were first described in severely malnourished Americans in Japanese prisoners of war camps in World War 2. It has also been described upon treatment of long standing anorexia nervosa, and alcoholic patients. It is important to have an understanding of these syndromes if you are attempting an extended fast – usually greater than 5-10 days at a time. Re-feeding refers to the period of time immediately after an extended fast when you are just starting to eat again. We’ve touched upon this briefly with ‘how to break a fast’. The two main syndromes are refeeding syndrome and refeeding edema. 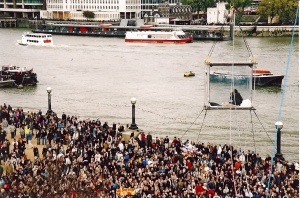 In 2003, David Blaine, the magician, emerged from a 44 day water only fast. Opinions abounded regarding whether or not he was cheating, although he was in plain sight the entire time. Doctors recorded every measurement they could think of afterwards during his hospitalization. He lost 24.5 kg (25% of his body weight) and his body mass index (BMI) dropped from 29 to 21.6. Blood sugars and cholesterols were normal. Free fatty acids were high (expected during fasting). He developed both refeeding syndrome and edema after this stunt. His phosphorus levels fell and required intravenous replenishment. Refeeding syndrome has been defined as the “potentially fatal shifts in fluids and electrolytes that may occur in malnourished patients”. The key clinical marker of this is hypophosphatemia – very low phosphorus levels in the blood. However, lowered potassium, calcium, and magnesium in the blood may also play a role. Calcium, phosphorus and magnesium are all primarily intra-cellular ions – that is, they are kept inside the cells and blood levels (which are outside of cells) tend to be quite low compared with concentrations inside cells. Adults store 500-800 grams of phosphorus in the body. Approximately 80% of the phosphorus in our bodies is held within the skeleton and the rest in soft tissues. Almost all of the phosphorus is inside the cell, rather than outside, in the blood. The blood level of phosphorus is very tightly controlled and if it goes too high or low, can cause real problems. Average daily intake of phosphorus is 1g/day, meaning that it often requires many months of undernutrition to produce these syndromes. Protein rich foods, as well as grains and nuts are good sources of phosphorus. 60-70% of the phosphorus is absorbed, mostly in the small intestine. Much of the calcium, phosphorus and magnesium in our bodies is stored in the bones. If the body needs more or these intracellular ions, it will take it from the bone ‘stores’. If there is too much, these get deposited into the bone. During prolonged malnutrition, blood levels of phosphorus remain normal and the deficit is taken from the bones. This can last for a very long time, as was proven with severe malnutrition imposed on the Japanese prisoners of war during World War 2. But there are some problems that can happen once food is given, particularly carbohydrate containing foods. During the refeeding period, insulin and other hormones are activated. This causes the movement of the major intracellular ions (phosphorus, potassium, calcium and magnesium) into the cells. However, due to overall depletion of body stores, this becomes excessive and too little of these ions are left in the blood. 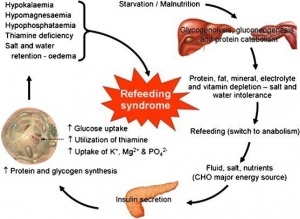 This is what causes the major symptoms of the refeeding syndrome, some of which are rarely fatal. Phosphorus is used in all cells for energy. The basic unit of energy (ATP) contains 3 phosphorus molecules so severe depletion of phosphorus may cause your entire body to ‘power down’. This typically happens when the serum phosphorus level drops below 0.30 mmol/L. The symptoms include muscle weakness as well as breathing difficulty as the diaphragm (the large muscle powering the lungs) weakens. Outright muscle breakdown (rhabdomyolysis) has been described, as well as heart dysfunction (cardiomyopathy). Magnesium is a co-factor in most enzyme systems in the body and severe depletion can result in cramps, confusion, tremor, tetany and occasionally, seizures. Cardiac rhythm abnormalities are also described – classically the pattern known as Torsades de Point. Most magnesium (about 70%) taken orally is not absorbed but excreted unchanged in the feces. Potassium may also be shifted into cells, leaving dangerously low levels in the blood. This, too can cause heart rhythm disturbances or even outright cardiac arrest. Insulin stimulates glycogen, fat and protein synthesis which requires many ions like phosphorus, magnesium, and cofactors like thiamine. The insulin surge puts an enormous demand on phosphorus stores which have been depleted. In essence, the stores of all these intracellular ions has been severely depleted and once the signal is given to replenish, too much phosphorus is taken out of the blood leading to excessively low levels. So you can see that one of the key pre-requisites for refeeding syndrome is severe, prolonged malnutrition. How common is it? A study of over 10,000 hospitalized patients only found an incidence of 0.43%. These are the sickest of sick people, but still was found rarely. This is actually on overestimate since it also included diabetic ketoacidosis, which is a different mechanism entirely. The main groups that had this disease? Severe malnourishment and alcoholics. Refeeding syndrome is most often described in the situation of parenteral (intravenous) refeeding in the intensive care unit. These patients are often intubated and cannot eat for weeks. In the setting of relative malnourishment, extremely calorically dense and nutrient rich fluids are introduced directly into the vein. A setup for re-feeding syndrome. 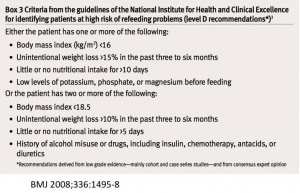 The main risk factor for re-feeding syndrome is prolonged malnutrition. When we use fasting as a therapeutic tool, most people have never missed a single meal in over 25 years! This is hardly the situation that we deal with currently. However, it is important to understand that patients that are severely underweight or malnourished should not fast. This is important because re-feeding syndrome is mostly found in the condition of starvation (uncontrolled, involuntary restriction of food) or wasting (starvation to the point of severe malnutrition) rather than fasting (controlled, voluntary restriction of food). Vitamin deficiencies have also been described, again mostly with prolonged malnutrition. The most important is thiamine, which is an essential coenzyme in carbohydrate metabolism. Typically, this has been described in alcoholics with the syndromes of Wernicke’s encephalopathy (ataxia, confusion, visual disturbances) and Korsakoff’s syndrome (memory loss and confabulation). Confabulation is a symptom whereby people have a complete lack of short term memory. They therefore ‘make up’ everything when they are talking because they have no memory. There is no intent to deceive. Traditionally, it has been taught to treat alcoholics and other malnourished people with thiamine (intravenous if needed) before treating hypoglycaemia. Theoretically, the glucose may stimulate acute thiamine uptake and precipitating Wernicke’s. Insulin acts on the proximal tubule in the kidney to reabsorb sodium and water. Higher insulin levels will result in salt and water retention. Low insulin levels will result in loss of salt and water by the kidney. This has been well described for over 30 years. During fasting, insulin levels go down quite significantly. This may lead to loss of salt and water. In some extreme cases there is up to 30 pounds of water weight lost, as George Cahill described in his article “Starvation“. The body is not able to hold on to salt and water due to low insulin levels. During re-feeding, especially with carbohydrates, insulin levels start to go back up, and the kidney starts to hold onto salt and water extremely tightly. Sodium excretion may fall to less than 1 mEq/day. In extreme cases, you may actually see gross edema. This can occur as the legs and feet start to become very swollen. Occasionally retention of fluid in the lungs leads to congestive failure in those with heart disease.This has been called”refeeding edema”. Obviously the mainstay of treatment is prevention. Box 3 identifies those at risk of re-feeding syndrome. Obviously the key is to avoid fasting a malnourished person, but that should have been pretty obvious already. The mainstay of treatment is to start feeds very slowly. Generally this means 50% of the needed food intake with slow increase in rate if no problems are found. This is reflected in the traditional advice to break a fast gently. This is more important the longer the duration of the fasting period. We have often seen people who eat too much as soon as the fasting period is over. Most complain that the food gives them a stomach-ache, but this usually passes quite quickly. I’ve never seen or treated re-feeding syndrome personally, and I hope never to need to. What happened in the Blaine fast? There were some differences in the fasting done by Blaine and the ones we use in the IDM program. First, it was a water only fast. Generally, we only use those in severe cases. We allow the use of bone broth during fasts, which is not technically a fast, but provides phosphorus and other proteins and electrolytes. This reduces the chances of developing the refeeding syndrome. Second, you can see that Blaine is suspended in a Plexiglas box for the duration of his fast. He is not able to do any of his usual activities and does not even stand up for 44 days. This is far more than a fast. His muscles and bones will actually develop significant atrophy during that period. He was losing far more than fat. He lost significant lean weight – muscle and bone, but this was NOT due to fasting. It was due to being cooped up in a box for 44 days. During fasting, we encourage our patients to do all their usual activities, especially their exercise program. This helps to maintain their muscles and bones. Dear Dr. Fung: I am cardiology from Argentine. I need help about a question: what strategies are effective for breaking adaptive thermogenesis (plateau) which produces the plateau in weight reduction with low-carb diets? Is there any role og T3 and T3R? Dr. Jason Fung: I have not used T3 or T3R. I generally try to change the diet or fasting routine to shake things up. When training or the the rise highly physically active, does fasting need to be more of the 16:8 variety to be beneficial or intermittent as in missing a meal or a day here and there? In other words for a training recreational athlete is there a fasting strategy that can be helpful and is there one that is not recommended? Would a partial fast like Dr. Longo’s Fasting Mimicking Diet – where you can eat 700 calories a day – prevent Re-feeding Syndrome/Edema? I’d really like to see a conversation between Dr. Fung and Dr. Longo. Though they have really different objectives (and Dr. Longo is a research scientist not a clinician), I think an exchange between them could be really fantastic. This is why I drink and cook with purified water with added cal, mag, and potassium all the time–even during fasts. I am hypertensive, and this water is my medicine (cheaper than pills). It also assures me of adequate electrolytes. No, the cooking does not destroy the minerals. If you don’t mind I ask how do you prepare your water? 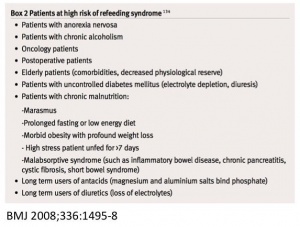 If you are 100 pounds overweight do you have to worry about refeeding syndrome? Also would I have to worry about it if I supplement magnesium potassium etc during the fast? @Devduttas, thanks. I’ll check it out. I still have 7 weeks into the challenge; will try monitor everything! Has anybody experienced diarrhea after short fasts, immediately after the first meal? (24-48 hour fasts) Do you have any recommendations to avoid this? Thanks. Hi David, yes I have experienced diarrhea most times i do a fast longer than 24+hours. I find it helps to eat something small to break the fast (boiled egg, piece of cheese, veggie sticks, soup or similar) 1-2hours before continuing with a bigger meal. I also skip breakfast every day, and do not have an issue – unless I try a fast greater than 24 hours. Thanks for your suggestions. I get this too! Within an hour or two of breaking the fast I get diarrhea. And at the risk of TMI often I recognize some of what comes out as what just went in to break the fast. How is that even possible?? Thanks for the feedback. Next time I’ll try breaking the fast with a snack, and having a regular meal later. Dr. Fung, are your patients weightlifting during fasting or that’s too intense activity? I drank lots of water during the fast. Around 3-3.5 litres of water. Should I drink more? I really don’t mind. I had constipation for years…only after have a full body chemistry balancing test did I find out I was low in magnesium. Magnesium is used by the intestinal muscles for movement…this was the sources of my constipation….get a good magnesium supplement…say goodbye to constipation. Can strictures in the pylorus and distal bulb/duodenum lead to this? This is what I have at the moment & am really struggling to eat solid food. Also, I am never hungry at all. Dr Fung, my close up vision gets blurry. I am diabetic and introduce carbs back in when I fast. Is there a solution to this challenge? I have been on a water fast for the past 40 days. I am actually so afraid of developing a refeeding syndrome and its complications that I am too scared to come off my fast. I have no MD in the vicinity that knows anything about this (my GP is quite lost on this), so I am on my own. How can I break my fast gently? Should I start with bone broth and move onto something like Avocado and nuts? I really need some sound advice on this, as this is quite scary for me. Hi Lola, hope it went okay? Please be careful when starting to break a fast. I just finished a 5 day water fast and broke that rule and ended up with edema in my right leg so that I could not bend my knee. Unfortunately, I loaned my Dr. Fung Fasting book to my daughter and can’t refer to it. I’m at a loss how to proceed, whether to go back to fasting and sart again or continue to eat lightly (steamed veggies for a while). Any suggestions? If you can, try a juice fast. I have done this before and never felt better. If you drink juices made mainly from veggies, the body will not recognise it as food… For more details and great recipes, you might like to check out joe the juicer (reboot with joe). I will not be doing water fasts again as the hair loss was VERY scary, but I will definitely juice on a regular basis. Like spring cleaning for the body! I have many many food sensitivities, basically down to meat and cooked veges (cannot tolerate anything raw or fermented). I have water fasted for 3 days (hope to go another 3 or so). I am wondering how to safely refeed as I am considering carnivore diet w/ intermittent fasting because of the food sensitivities, once I start to eat again.